Fancy some new rubber for the summer? Got a pair of old tyres you’re about to bin? 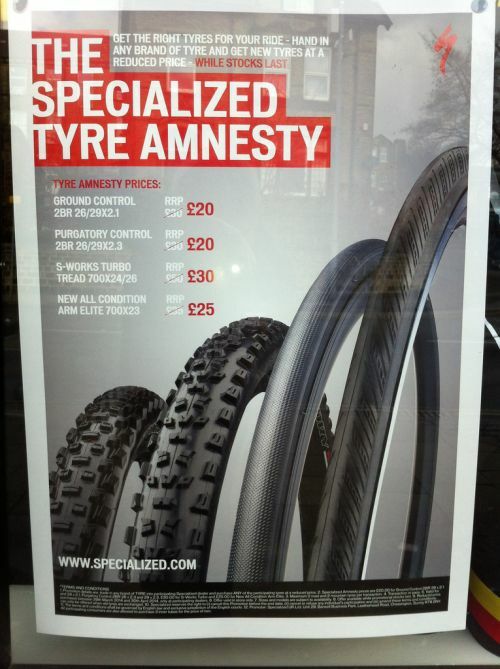 Well, whilst stocks last, we’ve got some of Specialized’s best tyres available at very special prices in our Specialized Tyre Amnesty. It’s very simple – bring in any brand of tyre and you qualify for new tyres at reduced prices. Remember, this is only whilst stocks last – once they are gone, they are gone! Pop into the shop today and pick up some quality new tyres for the summer! This entry was posted in Latest Offers on April 28, 2014 by pedalsportclub.